We here at SOCHA would like to wish you and yours, Irish or not, a happy St. Patrick’s Day! And who better to portray those wishes than a figure we have written quite extensively about, Fr. Patrick Mythen. A proud descendent of the Irish political figure Henry Grattan, Mythen spent a good portion of his life working for various Irish political causes, most especially with the Protestant Friends of Irish Freedom. 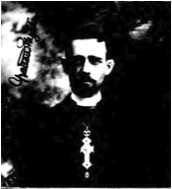 Upon his conversion to Orthodoxy in 1920, the former Rev. James Grattan Mythen took the name Patrick as an expression of his Irish heritage. It should come as no surprise, then, that Mythen loved St. Patrick’s Day. Ninety years ago today, in 1922, Archimandrite Patrick, then Vicar General of the Russian Archdiocese of North America, led the Protestant Friends of Irish Freedom’s battalion (with band) in the New York City St. Patrick’s Day parade. Happy St. Patrick’s Day from all of us here at SOCHA!